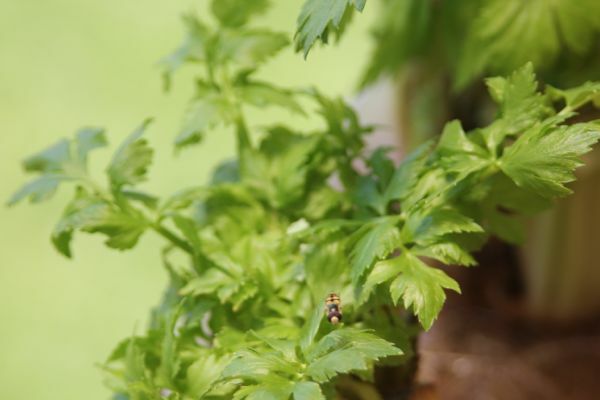 I remember when I was a child reading in a book and hearing that you could cut the top off a carrot, put it in some water (they always went into great detail about how to do this specifically saying the depth of water and the exact length of carrot root) and it would regrow a delicious edible carrot root. As a child I never believed it. Now that I am older I have head some distinguished permaculture people, as well as some highly regarded garden writers, claim that you can grow permanent beds of carrot roots by replanting the tops. I still didn't believe it, so I tested it with my kids. I also grew a few other things too. My thoughts were that the leafy tops would grow but the root would not, or if it did grow it would be forked and worthless. I dislike eating carrot leaves, so for me this would be a pointless endeavor. Transplanting carrots is never encouraged because if you damage the tap root the resultant crop is often misshapen or forked. Cutting the mature root and ending up with a decent yield sounded like yet another garden myth to me. 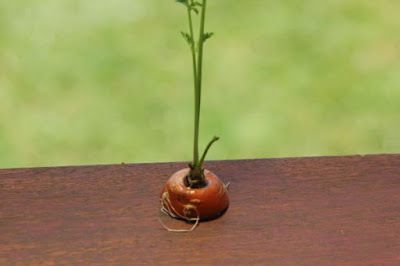 I have searched the internet and found many references to regrowing carrots from the discarded tops. Yet I have seen no pictures to back up the claims. 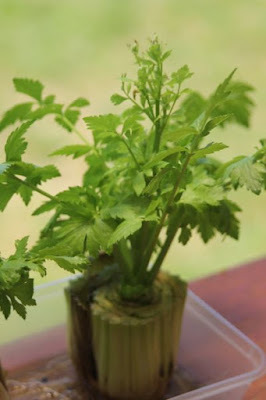 I have seen a few pictures that shows you can grow carrot leaves in this way, some show flowers, but no pictures of the roots. I have also read some detailed descriptions of people who do this, but they all refer to growing and eating the leaves or allowing it to flower and collecting seed. I dislike eating carrot leaves, and the tops can easily be used by feeding to animals or composting, so this does not interest me. When I grew them the leaves regrew nicely and the root grew some thin side roots, this made me optimistic that perhaps I had been wrong all this time and this could work. Then the carrot started to flower and died. The root did not elongate at all, and it rotted away. I have tried on some removing the flower stalk and they grew more leaves, but the roots didn't grow thick and edible. I have tried a few times now, always with the same result, the tap root did not grow long or thick. Not once. While this is far from definitive proof I saw enough to be convinced that it is unlikely to regrow carrots from tops. I believe that you can grow more leaves, you can get flowers and seeds, but I am still convinced that if any thick roots ever grew they would be forked and misshapen. 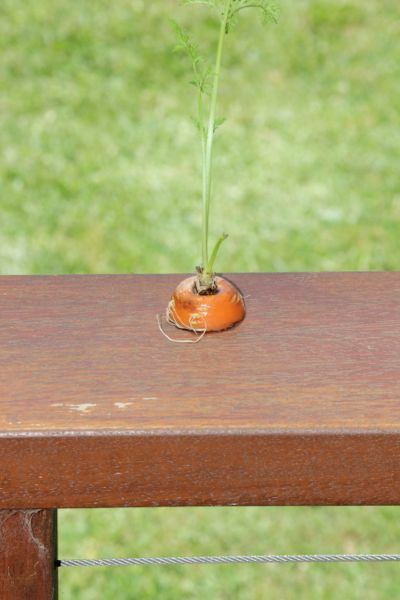 Growing carrots from seed seems to be far simpler and more cost effective. If am am jumping to conclusions here and you have tried this yourself and can prove me wrong then please let me know! Another thing I have heard about was regrowing celery from the discarded base. To me this made sense, it is just leaves growing so should be achievable. Again I searched on the internet, then tried it with my kids. 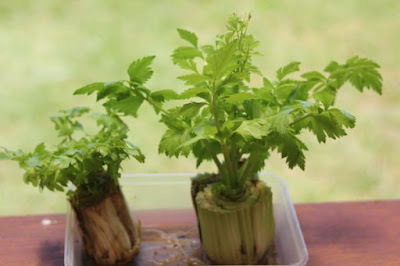 I grew a few discarded celery bases, some were larger than others. At first they all grew more leaves, as the stems and young leaves are the main crop here this already proved to have worked. They all grew roots. I planted some in the garden, others I kept in the water. Eventually some grew into normal looking reasonably tall plants, others flowered set seed and died. The ones planted into soil grew far better than the ones that were not planted in soil. It was not difficult to get a second crop out of each of them, even if it was far smaller than the first. We also had some other things such as pak choi and bok choi and a few similar leaf crop brassicas. Much like the celery I figured they should work as the leaves are the main crop. Again they all grew leaves fast enough, they grew roots and I planted some. The planted ones did better than the ones left in water. 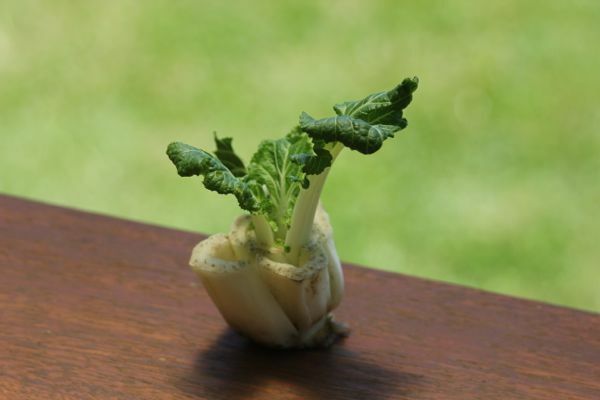 Much like the celery this gave us more crops from the same plant. They were smaller than the initial crop, but that is ok as it cost nothing other than a little water and space. Some of them grew into multiple plants and were able to be divided and replanted. Others did not. Eventually they all flowered and died. It would have been simple to save seed had I wanted to. Again, for a leaf crop, it was relatively simple to regrow these. I don't know if I will bother again as growing from seed is so simple and they produce many thousands of seeds. The bases can be fed to my animals or composted so are not wasted. I tried the same thing with beetroot. Much like the carrots the leaves grew well, but the root stubbornly refused to grow. Unlike carrot I like to eat beetroot leaves, they are essentially the same as silverbeet but are smaller and sweeter, so this was not a huge waste. I really don't think I will bother doing this again unless I am wanting to save seed as the space needed to grow a discarded beetroot top just for leaves is much the same as the space required to grow a beetroot for root and leaves. Again, I can compost these discarded parts so nothing goes to waste.